MEDICAL STORAGE: It’s all we do. 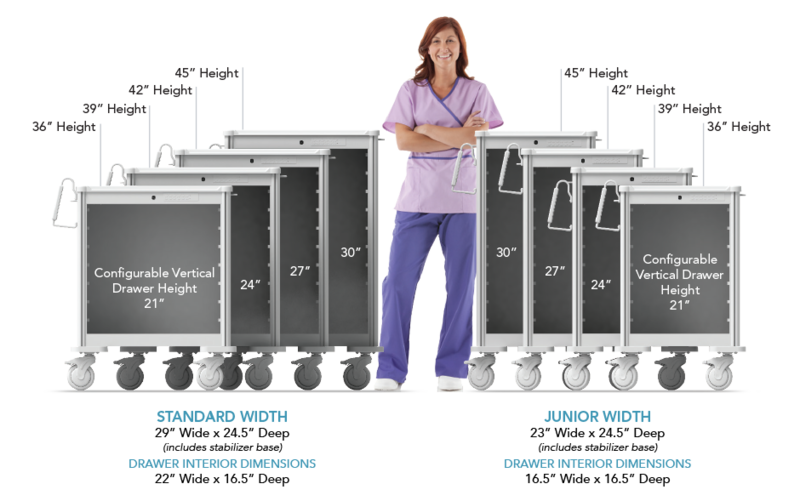 Our sole focus is to manufacture the best possible aluminum and steel procedure carts for the medical industry. We have been accomplishing this goal for well over Four Decades. 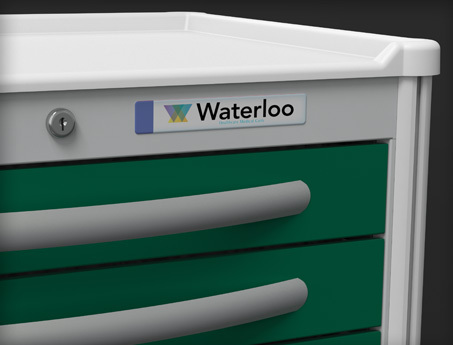 We know of Waterloo carts manufactured in the 1970’s that are still in service today…a testament to the quality we build into each and every cart! Let’s face it, carts aren’t rocket science, but getting the right configuration that will facilitate your staff’s needs can seem like it. That’s why our customer support team, national distributors and field sales reps are available to meet with you to help you match the right Waterloo cart for the job! Waterloo Healthcare’s singular purpose is to address the ever-changing requirements of our long-time customers in healthcare. 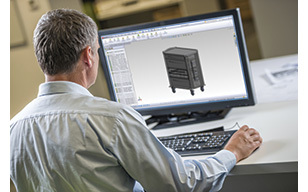 Our in-house staff of engineers pride themselves on their ability to create custom designs for our customers. If we don’t have a cart or accessory that serves your unique needs, chances are we can design something for you. Select ANY combination of drawer sizes and colors at no extra charge. Other cart companies charge for this privilege. 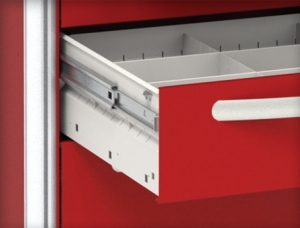 High-Quality “auto closing” drawer glides with 48 ball bearings per slide provide easy drawer access. 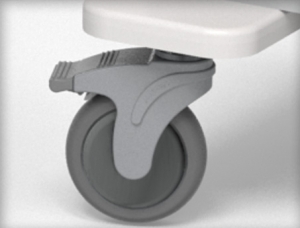 Our casters have precision sealed bearings for easy “maintenance free” rolling and thread guards to reduce hair, sutures and other material being collected around the axle. Our “one piece” nylon reinforced polycarbonate stabilizer base provides a wider, more stable platform that resists scuffs and scrapes, all while protecting your cart. Drawer fronts and drawer pulls are factory installed. Just decide which side you want the push handles on, and use the factory-supplied tool to screw them on and roll the cart into service. Please ask us about pre-installing the accessories prior to shipment as well. Local reps are available to bring a demo in for evaluation. Field service techs are available for any future changes or upgrades you may require as your needs and processes change. ALUMINUM vs. STEEL: Which is right for you? Our aluminum carts fly to procedures almost as if they had wings! That’s because they’re made of the same high grade aluminum as commercial airliners. Not only are they easy to get rolling, but more importantly, they are easy to stop. Our steel carts offer many of the same great features as our aluminum carts but at a more economical price point. 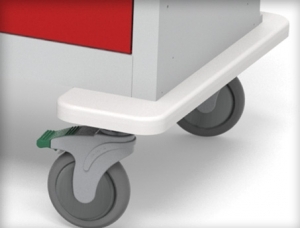 This series of carts has been a healthcare industry standard for close to five decades! Up to 30% lighter than steel carts. ABS cutaway top to minimize wrist strain while working on surface. Ergonomic push handles with adjustable height. Accessory mounting panels allow ultimate flexibility in mounting any accessories you need. Dual slide out surfaces above the top drawer for additional work surface on both sides of the cart. Built-in organizing system in each drawer with included dividers. More economically priced than aluminum carts. Ergonomic push handles – fixed height. Pre-threaded holes for set-position accessory mounting. ALUMINUM AND STEEL CART Standard Sizes. Getting the right ACCESS method. Waterloo has you covered when it comes to security. Whether you need controlled cart access or simple tamper evident locks, we have a locking configuration to meet your needs. 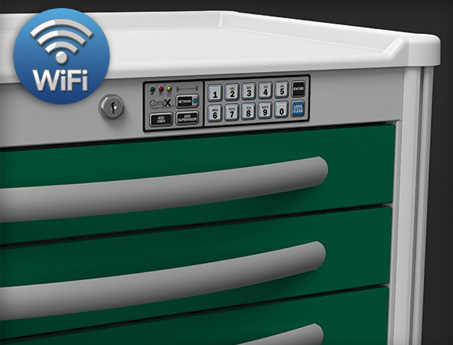 We also offer customized solutions that would allow you to lock specific drawers independently. Standard key-lock that includes two keys. On multiple cart orders, we will key all carts differently unless you request them to be keyed alike. Our centralized lever-lock provides easy access for your tamper evident breakaway seals. Additionally it serves as a “Transport Lock” that keeps drawers in place during rapid transit. 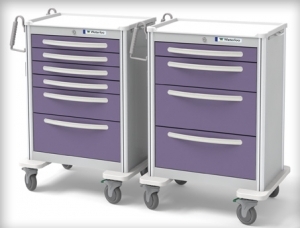 No more heavy fluid drawers flying open when turning corners en route to your procedure. Individual gate locks allow you to independently secure drawers with either breakaway or key locks. You can even group drawers together by department with larger gate locks. 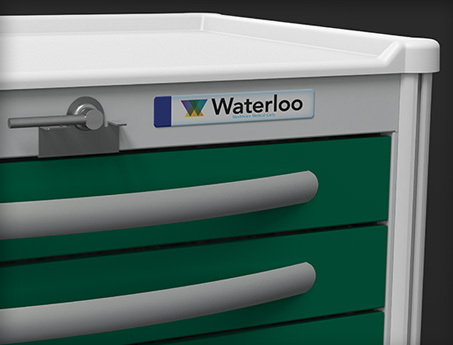 Gate locks can streamline Crash Cart re-stocking by allowing you to only restock drawers accessed during a code. Available in 3” increments up to a full 30” bar. Go Keyless with our reliable mechanical push-button lock. Requires no batteries and the combination is user adjustable. User programmable electronic lock accommodates many users and provides an audit trail of cart access. *Not available on full size Steel Unicarts. Adds the increased convenience of standard HID (Or iClass) Employee Card access to our user programmable electronic lock. 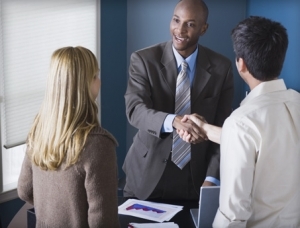 Accommodates many users and provides an audit trail of cart access. 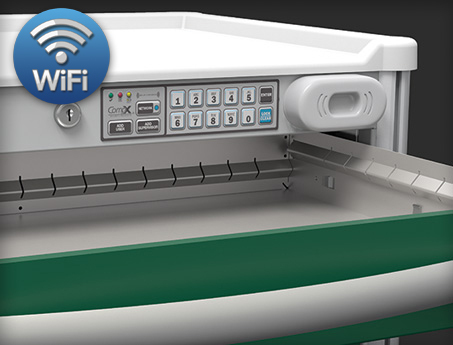 Keeps controlled substances secure in the top drawer by requiring two credentials to gain access. 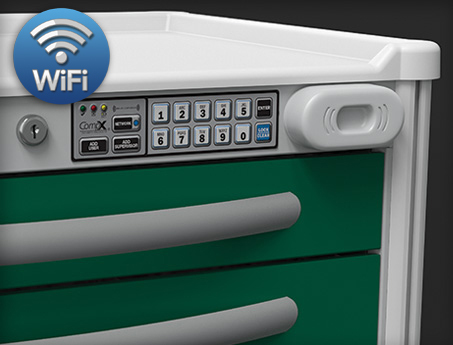 Proximity card swipe gains access to all drawer except the top “Controlled substance” drawer. A secondary key code is required to gain access to this drawer. Available on WiFi locks only. 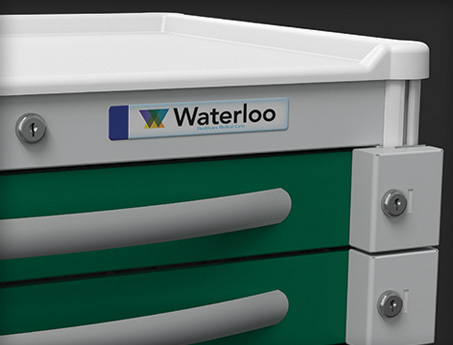 All Waterloo carts are coated with a highly durable powder paint that is designed to withstand the demands of the medical environment. The powder paint we use is designed to stand up to standard cleaning solvents used in central sterile supply for surface cleaning. 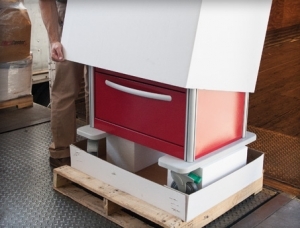 With 16 colors to choose from and the ability to mix and match drawer colors on a single cart you will be able to create a unique cart for your particular application and/or to match a specific decor.